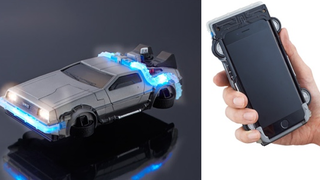 Well, not so much in a way that would allow it to travel in time or fly whatever, but it does turn your otherwise relatively sleek phone into a giant slab of Delorean-shaped plastic. So there's that! Majestic. The Delorean case even lights up when you get a phone call in a rather egregious manner, as if it wasn't unwieldy and attention-grabbing enough! It's not the first time the company have made a case like this, but even then, there's still something absurd about slapping a model Delorean to the side of your face whenever you answer a call. If you want one of your own, they'll set you back just under 6,000 yen - or around fifty dollars. What the what! For that much, it should be able to travel back to just before decided to purchase it and tell you to put your damn wallet away, creating a phone-case-induced temporal paradox. Now that would be worth it.